In past years, the Committee on Endangered Languages and their Preservation (CELP) ran a blog that was accessible through the LSA's page and was hosted by an external company. In 2014 we hosted our invited blog postings as "Notes" on our Facebook page, but we realized this was impractical and not sustainable. In the future, the LSA will upgrade to a new content management system with a blogging function, but for now we will make use of this "comments" page in order to migrate our older blogs and to continue with new blog postings in the first half of 2015. We thank you for your continued interest and involvement in CELP and its mission and activities, and in the LSA. "Introducing Undergraduate Students to Language Endangerment"
As discussed by Anderson (2011), language endangerment and loss remains a somewhat esoteric field of linguistics, which raises a question: What are the roles of the public and general educators in endeavors of language documentation, preservation, maintenance and revitalization/revival? According to Anderson, these activities must be woven into education levels from K-12 up through the undergraduate curricula. I would like to share my experiences and thoughts on my creation and running of an undergraduate course on "Language Endangerment and Death" as I have designed and am teaching it at Southern Illinois University, where linguistics competes with other programs in a larger English Language and Literature department. I would like to give a bit of historical context behind its conception, how I've designed and taught it to this point, and comment on ongoing challenges. I'm happy to share any of my materials with interested people. Just contact me directly at: khildeb@siue.edu. I'm also keen to hear about other experiences with running a course (or unit) like this. This course is living and dynamic, and it changes considerably from one running to the next. My students come from a range of discipline backgrounds: English, philosophy, foreign languages, anthropology, speech pathology, and early childhood education, etc. Most students were born and raised in southwestern IL and most are first-generation university students. Although there is racial, ethnic and linguistic diversity in greater STL, the prominent demographic profile in my undergraduate classes is that of white, monolingual English speakers. The upshot: my students are comfortable with their monolingualism in a prestige, global language, and they don't really see the point in cross-linguistic investigation beyond the specifics (problem-solving, analytical skills, and so on). When I first joined SIUE, I would typically show "The Linguists" to my students in the "general undergraduate survey" course. While that documentary comes with its own issues, I found that it opened up some interesting avenues of discussion and inquiry: Suddenly, my fieldwork in Nepal became more interesting beyond the phonology and morpho-syntax data sets used in class; my students had no fixed idea about the numbers of living languages in the world, nor their geographic and genealogical range; they had not had opportunities to formulate typology-diversity connections; they had very little prior experience with 'language endangerment' as a concept worthy of investigation; they carried with them the typical 'bias of the privileged' regarding language policies because they had not really been challenged to re-think this with data. So, they struggled to answer the basic question of why they should care about this issue. And thus, ENG 418 "Language Endangerment and Death" was born in 2012. I am teaching it now a second time. It is an elective as part of the linguistics minor. I view the course as a way to introduce basic concepts covered in intro-level "world languages" courses (language diversity, distributions, genealogical affiliations), and then to segue into observations from lesser-known and vulnerable languages. This opens the door to units on endangerment itself: causes, responses, orthography-viability debates, revitalization, revival, case studies, and so on. For class readings, I pull selected chapters, published papers, essays, press releases and blogs from a variety of origins. This means that I have only two texts assigned and the rest of the reading comes from articles and individual chapters. I have also found programs like "Lexicon Valley" and www.ted.com to be useful for in-class discussion of contemporary issues. Unsurprisingly, I have changed the reading list significantly between the first and second runnings of this course. One of the best aspects of this course is the increasing online presence of projects and resources (including in social media--a favorite place for my students). Added to this is the recent release of other documentaries, including We Still Live Here-- Âs Nutayuneân. Students are encouraged to investigate and report on sources, to contact scholars/activists and ask questions (when appropriate), and incorporate multi-media into their assignments. The course becomes less a top-down lecture about "why we should care" and more about self-discovery of issues and initiatives, sometimes in their own regions. The research project in particular asks students to document, regularly report, and ultimately write on endangerment/maintenance/revitalization issues concerning a specific language (or language cluster). Their final project includes structural observations (touching on typology) and applied coverage of the endangerment scenario of that language. Because of the increase in open-access and (frequently) free-subscription and online peer-reviewed publications like Linguistic Discovery, Language Documentation and Conservation and also clearinghouses of information like Paradisec and ELCat , they find it easy (and… enjoyable?) to engage in the necessary fact-finding missions underlying their research. They begin to be able to thoughtfully answer the bigger question dogging them through the semester: Why should I care about this issue? One ongoing practical problem comes from low enrollment, exacerbated by financial problems at state levels, resulting in course cancellations. I need to keep working on the promotion of this course. I view continued outreach to our larger student body and communication with other programs as my responsibility to the survival of this course. Another challenge that I regularly take on is a strong prescriptivism viewpoint that students bring (I see it in other linguistics courses too). Students equate an academic tradition and standardization as an automatic guarantee of language viability. I have built in a substantial and critically oriented unit on orthography and viability so they can confront and inquire on such viewpoints. I thank the CELP community for reading this (and our other) blog posts. Of course I value feedback, including updates on resources I have not yet heard about. I might add as a final note that my ENG 418 students have helped me in this area, as well! Anderson, Gregory D.S. 2011. Language hotspots: What (applied) linguistics and education should do about language endangerment in the twenty-first century. Language and Education 25.4: 273-289. Kristine, your course sounds great. I teach a course called "Survey of North American Indian Languages," which over the years has added more & more content on language endangerment & revitalization (for obvious reasons). UW-Madison has an ethnic studies requirement for undergrads, so I've designed it to fit that requirement, which solves the enrollment issue. It has no prereq's, so I get students from all over campus as well as linguistics majors. Last semester I started something new, which was showing short videos (like 5-10 minutes) in the middle of lecture just to wake them up - they liked that a lot. And there are a million to choose from on youtube. The Oklahoma Breath of Life, Silent No More Workshop (referred to as OKBOL) took place last month, May 18-23, in Norman, OK. Breath of Life workshops (originally created and held in California) are specifically designed for indigenous language communities that have no or very few fluent first language speakers. The aim of the workshop is to help interested individuals become comfortable navigating the existing documentation of their languages, since they will have to rely on documentation rather than speakers to learn their languages. This documentation is most often found in academic journal articles and handwritten field notes and texts. The documentation is not always easy to access, but even less easy for community members to use. Their languages are recorded in a variety of orthographies, they’re described with linguistic jargon (even worse, antiquated linguistic jargon), and what was recorded was often obscure paradigms, not the everyday language that people want to know. OKBOL provides the training in linguistics that makes these documents usable, helping to begin the process of language renewal for the individuals who attend OKBOL. Under the co-direction of Mary Linn (University of Oklahoma) and Colleen Fitzgerald (University of Texas at Arlington), OKBOL 2014 had seven language groups representing six distinct languages: Ft. Sill Apache, Lenape-Delaware, Myaamia, Muskogee Creek, Natchez, Shawnee, and Wyandotte. Every person at OKBOL has at least one of three roles: participant, mentor, and/or instructor. The participants are the language community members who have come to learn. The mentors are linguistics and anthropology students who aid and guide the learning. And the instructors are faculty or graduate students or community members who structure the learning through intensive courses. Everyone has at least one official role, but I think everyone at OKBOL participates, instructs, and mentors with each other throughout the week. So what do we actually do at OKBOL? Well, as a graduate student at OU, I’ve been a mentor at all three OKBOL workshop, so this post largely focuses on what OKBOL is like from that perspective. But hopefully this post can be helpful to anyone who wants to know more about Breath of Life workshops, what they are and how they work. This year, I was the linguistic mentor to two new Ft. Sill Apache participants: April Darrow, director of the Ft. Sill Apache cultural program, and Kam Killsfirst, an intern at the cultural program. The Ft. Sill Apache are a group of Chiricahua Apache that chose in 1913 to remain in Oklahoma, rather than move to the Mescalero Apache reservation in New Mexico. There are no longer any first language Chiricahua Apache speakers in Oklahoma, and it is uncertain how many there are in New Mexico (the closely related Mescalero Apache has become the dominant indigenous language on that reservation). Every day of OKBOL began with a class from Daryl Baldwin, director of the Myaamia Center, who shared with us his personal journey of language renewal. Not only did Daryl teach himself Myaamia using only documentary materials, but he has raised his children speaking Myaamia and has had a large part in mobilizing and motivating his own community toward language revitalization efforts. 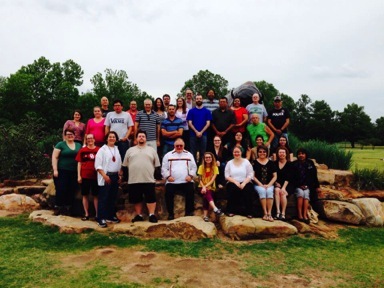 For the Ft. Sill Apache group, it was their first time attending a workshop so focused on language revitalization, and they found it very encouraging to hear from others in similar situations. After Daryl’s class each day, we had a phonetics and grammar class. Phonetics focused on learning about the technical jargon for describing sounds and reading the Americanist Phonetic Alphabet. For homework, we made a chart that gave correspondences between APA, IPA, and the Ft. Sill Apache’s community orthography. This chart now allows April and Kam to quickly make sense of past linguists’ work on their language. In the grammar classes, we learned about finding patterns in language data and how to figure out word order, morphemes for subjects, objects, and tense/aspect, and how to put this all together and create words and sentences. The afternoon classes were at the participants’ choice. OKBOL offered cumulative classes on technology, learning and teaching, and archiving, and everyone chose which one to take. Kam chose technology and April chose learning and teaching. Kam learned about Audacity, ELAN and FLEx, while April learned about lesson planning and staying in the language while teaching. After dinner, and during two group work periods each day, we had time to work on homework and the final project. At OKBOL, participants create a final project, usually designed to help them more easily use the documentation or teach the language to others. April and Kam did both. April created a lesson plan to help structure their bimonthly language classes and Kam worked on their FLEx database to create new materials for the classes. During one afternoon group work session, April, Kam, and I visited the Western Histories Collection at OU. During our visit, we found over 30 tapes, donated by April’s grandmother and consisting of recordings of her great-grandparents, Sam and Blossom Haozous, and great-aunt, Mildred Cleghorn. Most of the recordings are all in Apache, with people telling stories and singing songs. I’ll pick up the CD copies of the tapes next week to send to April and Kam in Apache, OK. I think the most amazing part of OKBOL is everyone’s desire and willingness to share. The participants, like April and Kam, share their language, knowledge, aspirations, and at least one week of their lives with us. Instructors like Daryl share their experience and expertise. On the last day of OKBOL, every group shares their final project with everyone. One participant, in describing her community’s language classes that she teaches, said that she has a motto to keep her students encouraged. Her class motto is “one word closer.” Every word is one word closer to learning the language. Every day of OKBOL, we tried to get everyone one word closer. By understanding what Harry Hoijer meant when he described that sound as a “spirant” in 1946. By finding the words to play “go fish” in Apache. By figuring out which morpheme on the verb means “I.” One word closer. As was mentioned on this blog in early April, the LSA sponsors an annual award to recognize community linguists. This is a new award, which was awarded for the first time last year. The award was proposed by the LSA’s Ethics Committee as a way to recognize the contributions to the field of linguists of language speakers, whose work is so vital to our field, but at the same time, sadly, seldom publicly acknowledged. Nominations for the award are now open (they are due July 1 every year; more on that below). Language speakers contribute to linguistics in so many different ways, it’s hard to give a single definition of a ‘community linguist’. The LSA’s website gives a couple of examples of types of contribution that we particularly want to recognize with this award, but there are others, of course. Just thinking about my own fieldwork, the community members I have worked with have contributed to language work in so many ways. Some of the contributions are directly related to linguistics. For example, several Bardi speakers have spent innumerable hours working with linguists for over 25 years. But she’s also volunteered her time to teach language classes at the local school, she’s looked after family members and encouraged them to speak the language too, and she’s consulted with other academics, such as anthropologists and ethnobotanists. Other contributions have been less directly related to language, but nonetheless important for language programs. For example, the local school has provided a lot of logistical support, families of speakers have helped with transport, other families have discussed cultural matters, and so on. The recipient of last year’s award was Mary Ann Metallic, from Listuguj, Quebec, for her long-standing and very impressive work on language teaching and revitalization with Mi’gmaq. Ms. Metallic has a longstanding involvement in a language teaching program in her home community, but she has also worked closely with linguists on language documentation. You can read more about the Mi’gmaq program at migmaq.org. anything else that the awards committee should know, in order to award the prize. The letters of support can come from anyone who is familiar with the applicants’ work. They could come from other linguists (other than the nominator) who have worked with the nominee, for example, or other people in the nominee’s community, their students, colleagues, and so on. The letters should say how the writer knows the nominee, and why they think the nominee is a good choice for the award. Applications will be held over for several years, so even if your nominee is not successful one year, their file will be considered the following year too. *Attempts to obtain written permission from Mr McEachern to reproduce this photograph were unsuccessful. Linguists at work documenting an endangered language often face polite skepticism and outright disbelief – ranging from puzzlement to hostility. Why do this? What’s in it for the linguist – or the tribes? The Language Conservancy and the Lakota Language Consortium (LLC) are two small non-profits that aim to support Native American tribes’ endangered languages. They see their work get pretty much the same kind of skepticism, from both outside and inside the tribes. Why do this? In 2000, the United Nations proclaimed International Mother Language Day, making every February 21st a day to recognize and honor all the languages on the planet as “the most powerful instruments of preserving and developing our tangible and intangible heritage … and to inspire solidarity based on understanding, tolerance and dialogue,” as the UN proclamation states. In that spirit, the Language Conservancy, in cooperation with LLC, created February 21st “Lakota Language Day” to shine a light on an endangered Native American tongue. 6. Honor yourself and your fellow students for your commitment to learning and speaking the language. LLC called out to its Twitter and Facebook followers to tweet in Lakota if they could. The responding tweets did their work, and the Lakota Language Day story was picked up by Indian Country Today newspaper. Their story about it was posted online the same day, and has been seen by more than 20,000 people. Ask a speaker to help you with pronunciation or understanding of a word or phrase. Other organizations and linguistic documentation programs can take the same action to assert respect for the human beings involved with the endangered language, and respect for the language itself. Reviving an endangered language requires a quiet little revolution in every learner – that much determination, that much dedication, that strong of a decision to go for it. Making a special day for the language can be a reminder that now is the time to make the language your own – even if it’s just one word or phrase. My superficial impression of the subfield of language documentation is that it is dominated by linguists who often find they must justify their activity to other linguists, primarily those enthralled to High Theory and dubious of the value of recording huge swathes of data in terms that are less controlled than orthodoxy prefers. I’m an anthropologist, and my discipline has been interested in what indigenous people have to say for a long time. Unfortunately , many of my colleagues view language as a transparent medium through which one can acquire data (the ‘content’ of the said) and view the particular code used by a speaker (the ‘form’) as just a problem or obstacle to be overcome through translation, whether that translation be careful or footloose. Of course these two stereotypes may be a slight bit unfair, but only slightly. The important thing is that those of us committed to language documentation need to get more colleagues on board. We need to evangelise our processes to the Grumpy Linguist and the Grumpy Social Anthropologist, people who don’t immediately ‘get it’. At the last research ‘away day’ for my anthropology department, I presented The whys and hows of language documentation for any work with speakers of minority languages in a 20 minute talk to social anthropologists. I was surprised by the enthusiastic reception; my colleagues at Aberdeen are not the Grumpy Social Anthropologists stereotyped above. I spent a few minutes deploying some of the canned arguments for why language endangerment is a Bad Thing and why language documentation is a Good Thing. I then presented a limited number of suggestions for making better recordings of speech events in an endangered language with some quick suggestions for good but inexpensive recording equipment. Staff were so taken with the whole thing, that we immediately made some small changes to our MRes in Social Anthropology training curriculum to include a bit on A/V recording and attention to producing quality recordings and simple workflows for archiving endangered language data as part of another project. At the end of the day, a quality sound recording with a simple .txt file transcription and translation, even just a partial translation, is much better than nothing. If it is in a very poorly documented language, then it could be a treasure. If it is in an endangered language already well documented, then it will be simple for that data to be more fully analysed and processed once the recording and decent transcription are made available on an internet archive. We should not be shy of taking crowdsourcing approach to language documentation. One does not need a PhD to produce high quality audio or video recordings and obtain a transcription, or at least an index, of the recording in an endangered language. The urgency is getting the recordings made before speakers pass on. People ‘get’ this with just a short explanation and a modicum of training, so prepare your soapboxes. August is a time when many faculty in the U.S. are working on their syllabi. Do you teach field methods or language documentation at the undergraduate level? Do you think there should be separate courses for those topics, or just one course? What are the basic topics you cover and what assignments do you give? Do you have syllabi to share? The Canadian Indigenous Languages and Literacy Development Institute (CILLDI) at the University of Alberta invites you to our 14th Annual Summer School, July 8-26 in Edmonton, Alberta, Canada. This summer we are offering a total of 20 University-accredited courses in the areas of language documentation, education and revitalization. Credit is available at both the graduate and undergraduate level, and bursaries/scholarships are available for both Canadian and International students. This course provides an introduction to the use of new technologies to aid in language revitalization in both home communities and urban settings. Topics will include computer-based learning tools, online language courses, and the innovative use of social media sites. Students will examine how these new technologies are being used in indigenous language communities around the world, and will design a language technology plan appropriate for their own community. This course explores how and why particular places are invested with social meaning by different cultural and linguistic groups. Students will analyze place-naming practices in their own and other Indigenous languages, and examine the ways in which people talk about place in both conversation and narrative. Students will also investigate various perspectives on map-making, and the ways in which Indigenous cultural and worldview can be incorporated into community mapping projects. The full listing of our Summer School courses is shown below. Courses marked (CLC) are part of our Provincially-recognized Community Linguist Certificate program, now in its seventh year. We look forward to having you with us in Edmonton this summer! Protect, Preserve, Promote, Practice and Pass On Your Language! NIEA needs your urgent attention this week to ensure Native culture and languages are protected and preserved for our next generations. The Esther Martinez Native American Languages Preservation Act (S. 3546), which authorizes and awards grants to support and strengthen Native American language immersion programs – including language nests, survival schools, and restoration programs – is currently up for reauthorization. With your help, we have the opportunity now to get the bill passed through. TAKE ACTION NOW. Call Senate Committee on Indian Affairs Chairman Akaka (D-HI) at (202) 224-2251 today, and urge him to use the “clearance” process for a quick passage of Esther Martinez. The Esther Martinez Native American Languages Preservation Act strengthens tribal language, culture, and identity. The survival of American Indian and Alaska Native languages is essential to the success of tribal communities and Native ways of life. The Esther Martinez Native American Languages Act provides tribes with critical support to establish and maintain immersion programs that revitalize Native languages. Download this brief on the Esther Martinez Reauthorization, and NIEA’s resolution calling for reauthorization of the act, to learn more. Over the next three years, we will be adding the videos to the index. While Randforce will be taking care of most of the digital indexing and database management for the project, I need help adding the remaining audio to the index, conducting oral history interviews, accessioning and cataloguing the backlogged interviews, writing abstracts for the interviews, adding the interviewees to our “people biographies” database in PastPerfect, and potentially assisting with education-related projects. The internship would be unpaid and it is possible that some of it can be done remotely. Because of the culturally sensitive and proprietary nature of the work, I am only interested in having the best and the brightest students/volunteers work on this project. The Seminole Tribe’s Oral History Program is utilizing some of the best technology available in the field and is on the cutting edge of field. We are a Smithsonian Affiliate and AAM Accredited Museum as well. This would be a great opportunity for a student or recent graduate to break into the field. As an aside, it is imperative for the students to understand that they CANNOT use any of the content in publications due to serious restrictions on the interviews put into place by the interviewees themselves or the Tribal Council. We utilize full informed consent and deeds of gift for the collection of our interviews and always observe the restrictions set forth by participants in the program. Interns may be required to sign a proprietary agreement with the Tribe. They may, however, share process and experience with others, which I have found is perfectly fine in the field. Yesterday, in a blog post on Crikey Ngurrju!Manymak! Pupuni! NT drops First Four Hours in English policy, Greg Dickson broke the news that the NT Department of Education and Training has finally reversed its policy of Compulsory Teaching in English for the First Four Hours of Each School Day. Communities, linguists and educators have lobbied long and hard for more than three years for the reversal of this retrogressive and damaging policy. Greg Dickson, Piers Kelly, Jane Simpson and other linguist commentators have written on numerous occasions about this topic on Crikey (e.g. 4/5/12, 4/11/10) and the Endangered Languages and Cultures Blog (e.g. 2/11/12, 31/8/11). AuSIL wrote many letters and media releases, held public forums, and produced the “Indigenous Languages in Education: What the Research Actually Shows” booklet. Opposition to the policy was a strong theme in submissions to the House of Representatives Inquiry into languagelearning in Indigenous communities. The Guidelines documents offers the advice that “Learning English as an additional language is complex and multifaceted as different first languages may present different challenges for teaching. The complexity of the EAL process means that schools must choose instructional approaches appropriate to the linguistic and cultural backgrounds of the learners.” Further, “Instructional programs must promote positive and accurate representations of children’s (and families’) first language and cultural heritage”. These points must offer encouragement to NT communities who have keenly felt the destruction of language programs in their schools, and the concomitant impact of the detrimental 4 hours policy on school attendance and wellbeing within the community. Congratulations to all who have fought so hard for this outcome! Much work now lies ahead to rebuild programs and we wish strength to al through the coming months. The Chickasaw people, living all over the United States but whose government seat and most concentrated numbers are in central Oklahoma, saw that their language was quickly fading away with the deaths of elderly speakers – the situation that most American Indians have found themselves in. Presently there are fewer than 75 speakers, all over the age of 55. Chickasaw Nation, under the leadership of Governor Bill Anoatubby, decided to do something about that. Building on the small language program begun in the late 1990s, Chickasaw Nation established the Chickasaw Language Revitalization Program in 2007, and created the department of Chickasaw Language in 2009, with seven full-time employees and a 24-member Chickasaw Language Committee. UCLA linguist Pam Munro serves as the program’s consultant, along with John P Dyson (Associate Professor, Emeritus, Indiana University at Bloomington) who also co-teaches Chickasaw language classes at East Central University, Ada. The Chickasaw have a long and storied history since separating from the Choctaw circa 1450. Today Chickasaw tribal history is conceptualized in four seasons. Summer, the start of the Chickasaw New Year, marked by the Green Corn Ceremony, is understood as encompassing the lives of Chickasaw ancestors pre-contact. In this time our lifeways and language were fully intact and strong. Fall, marked by the closing of the ceremonial grounds and preparation of food for the long winter, is understood as encompassing the challenging years of the eighteenth century, when the Chickasaw were hard pressed on all sides by the French and French-allied Choctaw, losing hundreds of our people to warfare and disease. From the Yamasee War beginning in 1715 though the defensive consolidation at Old Town in present-day Tupelo, Mississippi, to the flight of 80 Chickasaw to the Savannah River near present-day Augusta, Georgia circa 1720, the Chickasaw declined to a nadir of as low as 1600 individuals by 1760. Winter, marked by hunger, months of limited food and long nights filled with tribal stories, is today understood to encompass the horrors of Removal to Indian Territory beginning in 1837, the struggles of reestablishing our nation in these new lands, the losses of the Civil War, and the heartbreak of allotment, as our tribal government was for all intents and purposes terminated and our tribal lands broken up into individual allotments. Winter continues into the lean years of the early to mid-twentieth century, as we struggled to survive without a functioning government, limited financial resources, and a population increasingly forced to leave traditional communities in order to find work. Spring, traditionally marked by the return of ball play, dances, and the first growth of wild onions, is today understood to encompass our present Chickasaw cultural and political renaissance. Mounting a full-scale revitalization effort, the Chickasaw Language Revitalization Program has instituted an astonishing number of projects. Speakers Jerry Imotichey and JoAnn Ellis teach four levels of Chickasaw at East Central University in Ada, OK. They have 15-20 students in each of their classes. At Byng High School, two levels of Chickasaw language are taught for credit. With the assistance of Leanne Hinton (University of California at Berkeley), Mr. Hinson has organized a Master-Apprentice program with six teams of speakers and their language apprentices. Additionally, a group master-apprentice class meets regularly. Chipota Chikashshanompoli, a children’s enrichment program for primary through middle school youngsters, meets once a month. They learn vocabulary words based on themes but also learn pieces that will be performed in competition at the annual Youth Language Fair, hosted by the Sam Noble Oklahoma Museum of Natural History at the University of Oklahoma (contact Mary Linn for more information). Community language classes are held in the towns of Norman, Purcell, Ada, Tishomingo, Ardmore, and Sulphur. Employee language classes give special attention to those who represent Chickasaw Nation. Family immersion and sports camps, organized periodically, keep focus on the language while playing together. The department of Chickasaw Language also sponsors projects that affect the organized Chickasaw community councils outside Oklahoma. The department of Chickasaw Language offers a Word of the Day (chickasaw.net) and Word of the Week (contact Hanna Corsello) for those who want a small infusion of Chickasaw language practice. Language videos and additional resources can be accessed at chickasaw.tv. Finally, the program offers both translation services upon request and language materials that can be mailed to anyone who desires to learn the language at home. Mr. Hinson himself is seeking an interdisciplinary PhD from the University of Oklahoma in Native Language Revitalization. A trained artist in his former career, many of his works can be seen in the Chickasaw Cultural Center and in the homes of lucky patrons. Josh and his wife also encourage the use of Chickasaw in their home, reasoning that their children are the ones who will carry on the language. All language programs should feel encouraged and inspired by the excellent work coming from Chickasaw Nation. Welcome to our new chair, Mary Linn! For the past few years, the Committee on Endangered Languages has benefited from the wise oversight of Carol Genetti (University of California, Santa Barbara), who has worked hard to see CELP reach its full potential, beginning initiatives in political activism, organizing panels at conferences on endangered languages, and launching CELP’s (social) media presence. All of us are grateful to have worked with her. My main interest lies in the documentation and description of American Indian languages and language use in context. I focus on the Euchee (Yuchi) language, languages of the Southeast, and more broadly on the languages of Oklahoma. I am fascinated by what motivates morphological variation and change. I work actively in language revitalization, and much of my research is about and is situated in community-based language revitalization. This approach includes the training of community members in language documentation, linguistics, language teaching methodology, and culturally-based language curriculum development. I am interested in strategies for youth language acquisition. I curate the Native American Languages collection at the Sam Noble Oklahoma Museum of Natural History and extend this work by studying the roles of archives in language revitalization and the formation of community-based archives and accessibility. Her most recent work includes A Reference Grammar of Euchee (Yuchi) (University of Nebraska Press). Please join me in welcoming Mary as our newest chair, and thanking Carol for all her dedication and hard work! The theme of this session is on the role of Linguistics in endangered language revitalization. 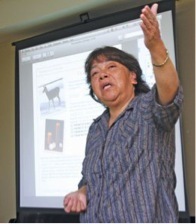 While there has been a growing focus within the field of Linguistics on “best practice” methodologies for endangered language documentation, there are many challenges – for linguists, for educators, for indigenous community members – in how to move from the “documentation” (past or present) of a language which is no longer actively spoken within families and communities to its effective “revitalization”. Our goal is to illustrate through six case studies – representing diverse languages, contexts, and approaches – how linguists can contribute to language reclamation initiatives, and of how these efforts can, in turn, contribute to documentary linguistic practice so that it can better serve endangered language revitalization. The challenges are multi-faceted and range across a broad array of transdisciplinary issues that are often subdivided into independent academic departments, disciplines, and faculties. Among the many challenges are: how to breathe life into archived manuscripts that have lain dormant for generations; how to interpret and use the formal categories of linguistic analysis that characteristically underlie the organizational structure of “dictionaries” and “grammars” for the development of curriculum materials that can effectively engage – rather than obfuscate or simplify – the underlying essence and complexities of a language; how to confront the realities of linguistic diversity and of language change as they impact on language revitalization; how to recognize and respect deep-seated psychological factors related to language prohibition, degradation, and loss, and their residual impact on indigenous community members’ attitudes about the value and future of their linguistic heritage; how to address the interface of literacy and oral traditions, the sometimes conflicted attitudes to “documentation” and archiving, the honoring of traditional heritage within the cultural worlds of the present; how to move beyond the teaching/learning of individual “words” and phrases into issues of thought and cognition, into ways of knowing and traditional knowledge systems as embedded in and/or reflected through linguistic structure. Many linguists are eager to assist communities with revitalization efforts, but often are unaware of the diverse complexities, or feel daunted by the time commitment, or confront a lack of training in “applied” skills. There are many possible strategies and models for addressing these issues. In presenting these case studies of communities that are actively engaged in revitalization programs, our aim is to provide not only a diversity of approaches based on the collective experience of various leaders in the revitalization movement, but also a platform for discussing the complexity of these challenges. Our over-arching goal is to explore how the insights and dedicated efforts of those working in language “documentation” and those working in language “revitalization” can most effectively contribute to each other and to the continued vitality of the world’s linguistic diversity for generations to come. Hundreds of years ago it was prophesized that our language would be lost, and that the children of those who had a hand in breadking that circle of language will have to work very hard, together, to welcome the language home again. For the Wampanoag, the loss of all speakers has provided the greatest opportunities for instruction, productive work, and solidarity with the contemporary generation as well as with those Ancestors that have been long on the other side. There is a great awakening to our responsibilities to the privilege of language. Indigenous nations caught on the continuum of speaker loss grapple with the same questions: whether and how to write the language, how to use dormant documents for language and cultural reclamation, and be put toward meaningful contemporary expressions in our Languages. We will discuss strategies employed by the Wampanoag People in response to these questions and others. This describes a twenty-year collaboration between a linguist and a native community on the documentation, description, analysis and revitalization of the Klallam language. The linguist collected and analyzed language data. Then with the teachers packaged this information into culturally appropriate learning tools through a process of mutual guidance. The linguist provides material on grammar in formats suggested by the community. It is then modified based on feedback from the community. Klallam is taught from pre-school through high school and adult classes. In the high school program, begun in 1998, hundreds of students, some now teachers of Klallam themselves, have had deep exposure to the language. The Klallam language program demonstrates that language documentation and revitalization are not mutually exclusive; in fact, through a process of mutual guidance, they support and enhance each other. This paper presents, in summary, the perspectives of the linguist and three key teachers in the program. In this talk, we address how existing language documentation serves revitalization purposes, using a case study from Tohono O’odham, a Uto-Aztecan language spoken in southern Arizona. The focus is on breathing new life into an out-of-print dictionary published by Madeleine Mathiot in 1973. An electronic version converted to the official orthography is being edited. Via a collaboration in parallel with Dr. Mathiot and O’odham teachers and tribal linguists, the dictionary is morphing into something with potential for new life and more uses. One way to enrich the electronic dictionary is to link the entries with the texts that provide out-of-context sentences or the audio. Another might be to add a ‘lite’ version (with fewer sentences) to increase its accessibility for learners. The rich documentation presented by the Mathiot dictionary offers valuable lessons for those engaged in documentation and revitalization projects in terms of anticipating limitations and future community needs. The Yurok language (northwestern California) has several first-language speakers, and very active education and revitalization programs sponsored by the tribe and community groups. Our focus is on the use of language documentation in revitalization. The long history of Yurok documentation includes vocabulary and sentences recorded since the 1880s, text and grammatical documentation by academic researchers since 1901, a rich body of material recorded within the community, and a significant archive of audiovisual documentation created by the Yurok Tribe. To ensure that learners are directly exposed to the speech of fluent elders (not just advanced learners), we have made the corpus of recordings used for academic research available in the community and have created online tools for access. For practical language education and revitalization purposes it has been necessary to reorient research in two ways. First, grammatical topics are described in “etic” and not “emic” terms. Second, text-based grammatical research is pedagogically driven. 5. Linguistics and language revitalization: community capacity-building. In this presentation we draw on some of the complex challenges of language documentation, analysis, and revitalization that we have faced over a 15 year collaboration between a university-based linguist and the adjacent həəmiə (Coast Salish) community. Our approach is grounded in a commitment to capacity-building not only in “language learning”, but also in training community members in the linguistic principles, analytical methodologies, and perspectives that will give them the skills to be active research participants and to better assess many issues that impact on the future of their language – like evaluating competing orthographies, mastering complex morphophonemic variation, debating what’s dialect difference vs. language atrition, asking how linguistic knowledge about diachronic language change might contribute to notions about ‘purism’? Although initiated for the exchange of complementary systems of knowledge, the unanticipated co-construction of knowledge process that has evolved is leading to better documentation, better linguistic understandings, and better foundations for revitalization. The story of Myaamia (Miami-Illinois) language loss over 100 years ago and its reclamation today is relevant to other tribes experiencing language loss. There are four pillars at the base of our reclamation efforts: as a tribal member, I had to get a linguistics degree; community elders had to support my desire for education and my efforts to revive Myaamia; the community had to develop interest, over time; and tribal leadership support was critical. Each of these foundational pillars depends on the ability of all involved parties – including linguists – to form healthy working relationships. We work hard to break down the us (native) and them (researcher) barrier. We very much believe in home-grown talent and the role of non-tribal linguists is to help us accomplish that. I think there is a place within our tribal communities for quality non-tribal linguists and our experience provides a good example of that. 9:00- 9:30. Baird, Jessie Little Doe. From Our Ancestors Hands to Ours. 10:00-10:30. Fitzgerald, Colleen & Phillip Miguel. Breathing new life into Tohono O’odham documentation: The Mathiot Dictionary Project. 10:30-11:00. Lewis, Carole & Andrew Garrett. Using documentation in Yurok language revitalization. 11:00-11:30. Shaw, Patricia A., Jill Campbell, Larry Grant, Marny Point, Fern Gabriel. Linguistics and language revitalization: community capacity-building. 11:30-12:00. Baldwin, Daryl. neetawaapantamaanki iilinwiaanki: Searching for our Talk. This documentary tells a remarkable story of cultural revival by the Wampanoag of Southeastern Massachusetts. Their ancestors ensured the survival of the first English settlers in America, and lived to regret it. Now they are bringing their language home again. The story begins in 1994 when Jessie Little Doe, an intrepid, thirty-something Wampanoag social worker, began having recurring dreams: familiar-looking people from another time addressing her in an incomprehensible language. Jessie was perplexed and a little annoyed– why couldn’t they speak English? Later, she realized they were speaking Wampanoag, a language no one had used for more than a century. These events sent her and members of the Aquinnah and Mashpee Wampanaog communities on an odyssey that would uncover hundreds of documents written in their language, lead Jessie to a Masters in Linguistics at MIT, and result in something that had never been done before – bringing a language alive again in an American Indian community after many generations with no Native speakers. Originally posted October 18, 2011 by Emerson Odango University of Hawai‘i at MānoaAs a graduate student, I frequently wonder whether I’m doing the “right” thing – am I asking relevant research questions, making insightful observations, somehow contributing in a meaningful way to the academic discourse? In the field, the questions are different but the concerns about “the right thing” remain the same – am I respecting the collaborators’ immediate goals and responsibilities, reimbursing their time in culturally-appropriate ways, learning how to listen carefully before asking questions? One thing in particular that I grappled with on a recent fieldwork visit to Micronesia was trying to explain the nuances of a consent form to the community members with whom I worked. During May and June 2011, I continued my long-term fieldwork on Mortlockese as spoken on Pakin Atoll in Pohnpei State, Federated States of Micronesia, graciously funded by an Arts and Sciences Student Research Award from the University of Hawai‘i at Mānoa. I have been working with the Pakin community for several years now, first as a Peace Corps Volunteer from 2006 to 2009, and now as a researcher in linguistics. For me, though, I see the community not as a collection of native speakers of a minority outer island language in the FSM, but rather as friends and family with whom I continue to forge interpersonal relationships. I still go back and live with my Peace Corps host family during my summer fieldtrips. My former students – my first real teachers of conversational Mortlockese – never cease to share their jokes, stories, and songs with me. I felt privileged that the handful of adults on Pakin who are known as the best storytellers on the island invited me on several occasions to be an audience to their tittilap ‘stories’. The term “community” for me primarily refers to “people”, and then “language”. I clearly remember some of the first pieces of advice the Peace Corps staff gave us early on in our training: rather than jump headfirst into project implementation, take the time to form interpersonal relationships with your host family, counterparts, students, and the wider community. I feel that the length of time that I spent with the community has allowed me to gain their trust, and them mine. This gives me the confidence to ask questions in meaningful ways, questions which I feel they would be more willing to answer candidly and honestly as compared to responding to questions posed by an academic “passerby” to their islands. The task of asking the “right questions” could not be more relevant than in regards to consent forms. As required by the University’s Committee for the Protection of Human Subjects, I provided copies of consent forms to the contributors. The forms were approved in English, but I gave the contributors Mortlockese-translated versions. Despite the attempt at making the content of this form accessible to them in their native language (which is itself a novel idea, since “official” forms are always either in English or Pohnpeian), I still couldn’t help but feel a little uncomfortable about it all. Mwéúmwéútáán ‘permission’ in their community is given verbally, expressed through real action, enforced by social consequences…it’s not expressed in writing or by checking off boxes and signing names on lines. How could I talk about this unwieldy document in a way that would be relatable for them? Some concepts were a little easier to talk about than others. For example, the idea of a public digital archive isn’t so foreign when compared to a leenian iseis pwuuk ‘library’, which they have in the form of an elementary school library on Pakin, as well as libraries on Pohnpei. Others, though, are rather nuanced, such as engaging in conversations with the consultants regarding the reasons why their recordings would be placed in such an archive, or why others outside of their community would be interested in their stories. In the end, I realized that it just came down to asking questions and explaining the reasons for asking them. I felt that one question, though, was one of the most important questions I needed to ask: “Can I archive everything that we’ve recorded?” I wanted to clarify with the contributor if there was anything from the recordings which he/she did not want to be archived. This is a fundamental aspect of asserting the agency of the contributor during fieldwork. I wanted to make it clear to everyone who helped me with my fieldwork that he/she has the right to indicate what will or won’t be made public to others. I would affirm with them by saying, esapw áái angaang, ngé aash ‘it’s not my work, but ours (inclusive)’. In almost all cases, the contributors had no reservations about allowing the entirety of their recordings to be archived. I’m certain that many of them felt a certain measure of pride that their words would be heard by others far away. But in one particular case, I was so happy to hear someone say, “No”. Lucila Linge (left) recollecting personal narratives with Emerson Odango on Pakin Atoll (June 2, 2011). This summer I had the opportunity to record narratives with Lucila Linge, one of the eldest residents of Pakin. I was very excited to work with her because she is a member of the last generation of Micronesians who were alive during the Japanese occupation of the islands during WWII. Nohno Lucila (Mother Lucila) was only a child during that time, but she vividly remembers experiences on Pohnpei such as airborne firefights and running away from dust clouds of debris! Nohno shared a variety of narrative accounts with me, including some that pertained specifically to her parents and family. It was truly a privilege to hear her stories; it never ceases to amaze me the kind of connections we can make to the past – especially to events with such global significance – all through memories and words. As I brought out the consent form at the end of our recording session, I explained to her the idea of placing her recordings in a digital archive so that they would be available to other Mortlockese, Micronesians, and re wóón ‘foreigners’ who may be interested in her stories and language. When I asked Nohno if there was anything she would like me to exclude, I remember her stating this so clearly, so gently: the only narrative that is to be publicly archived is a specific account of visitors to Pakin during the Japanese occupation; everything else that pertains to her family will not be archived. It could not have been clearer than that; I didn’t need to ask why. Sensitive information pertaining to her family will remain private, as simple as that. How exciting it was to hear someone say “No”! This was agency in action, such a clear example of someone deciding what will and will not be made available to public ears. I couldn’t help but feel a little proud of myself, since I was able to explain in Mortlockese to someone whom I hold in great esteem that she has the right to control the access to her recordings. She understood what I was trying to explain…which was quite an accomplishment, since I’m fairly certain that I was stumbling through my attempts at translating things like “open-access” and “anonymity”! That experience remains with me as something truly emboldening for future work. Even though the questions we need to ask may be difficult to explain, or awkwardly translated (both in language and in culture), that shouldn’t be a reason not to make every earnest attempt to ask. We should have faith that our consultants – shienash ‘our friends’, really, if we are privileged to have such a relationship – will trust us and reply honestly. In the spirit of collaborative fieldwork, I’d like to consider the word “no” as being just as empowering as the word “yes”, for both the researcher and the contributor. When I set out to write this blog, I had a completely different topic in mind. I was planning to write about the confluence of disciplines: language documentation and description with folklore and (ethno)musicology. And then I opened my Facebook page. I have to admit, I do not do this often enough. But having recently moved from Oklahoma to Washington, D.C., I have found a new appreciation for how Facebook keeps me informed about the doings, large and small, of my friends back home in Oklahoma. I was shocked to see multiple posting about legislation proposed in Oklahoma banning AP American History from being taught in public high schools. Their argument is that telling multiple sides of history focuses on the bad, and education should focus on the positive and, supposedly therefore, the patriotic. Like my colleagues on Facebook, I followed a path of emotions: outrage, depression, then happiness at seeing Norman High School students protesting, and finally cheering on the cartoonists and satirical memes. I have lived through similar feelings before. I called Kansas home in 1999 when we were blindsided by the Kansas Board of Education deleting evolution from the science curriculum. But this one seems more personal. At OU, I was lucky to get to teach a class on language endangerment. The class engaged both undergraduate and graduate students. Despite many having strong backgrounds in linguistics and/or having come from Native communities themselves, the undergraduate students were often unprepared for the topic. So, I always had them write a reaction paper at the end of the semester. The reaction paper helped them manage the progression of their learning, and it helped me know better just where students were most likely to have trouble, and I could adjust my teaching to this. One reaction paper in particular stands out. Kyle Shaw, who has since graduated with honors in linguistics, describes how his linguistics course in 2012 made him reevaluate his education and the societal norms they are embedded in. This scrutiny did not cause him to hate where he was born and raised, but rather created empathy towards others and a desire to learn more. Every linguistics class that we teach where we cover linguistic diversity, language documentation, language contact, or endangered languages helps recover some of what is deleted from the historical record, and what some do not want in the historical record. But now I will let Kyle speak for himself, and for all the students around the country who want an education that makes them look closely at the world around them and become better people and citizens for it. “Walking into my University of Oklahoma course Language Contact, Loss, and Revitalization at the start of this semester, I experienced very mixed feelings. I was excited to learn more about these concepts upon which other instructors had only touched; it was a part of my major, it only made sense to be intrigued. Simultaneously, I felt tinges of trepidation; from what I had heard, this was bound to be a less-than-happy subject, and I often wondered, what if this turned me off from the field altogether? In hindsight, I was right to worry about its content - the subject did indeed prove to be a depressing one, and at times caused me more grief than I ever could have expected. This, however, pales in comparison to the wealth of knowledge I have absorbed over the semester, and its incredible worth. I learned many, many things from this course, but one in particular stands out to me: Language endangerment and revitalization discussions need to be worked into the educational sphere outside of my own very specific linguistics major. I grew up in Tulsa, Oklahoma. My freshman year of high school, my peers and I were all shocked to learn about the Tulsa Race Riot of 1921. What shocked us most was not that it happened. Certainly it was deplorable, and the lives lost an outrageous crime. But what shocked us most was that nobody had ever spoken about it, or even mentioned it in passing, and we had to hear about it in a high school history course; it was as if not only was the city ashamed about it, but it wished to hide it from us and from themselves, so as to forget. How often had we walked down the same avenues and traversed the same streets where less than one hundred years ago people rioted, set houses aflame, and spilled blood? I experienced a similar shock several times during this course; not all at once, as with the discovery of the race riot, but a slow shock which began to pervade more than just one domain of my life. One was when I began to confront my high school mascot, an image of a Native American which they lovingly (and I do mean lovingly) refer to as the Redskin. I was raised to be a tolerant and at least somewhat culturally sensitive person, so I would never call an African American the "n-word" or a gay person the "f-word." But while I knew that to most Native Americans the "r-word" is considered a slur, I continued using the term freely and openly anyway. It was our school mascot, a frequent word in our fight songs, featured in the introduction to every parent-student handbook - what was I supposed to do? I knew it was hypocritical of me to give a pass to all these inaccuracies, stereotypes, and offenses. When I began studying linguistics, and particularly when I began taking this course, this was brought to the forefront of my mind and, especially after meeting so many Native community members, it has become something of which I am deeply embarrassed. When I learned how many dozens of Native American languages there were which Oklahoma claims as its heritage, but which are endangered, I wondered why I had heard little to nothing about the subject in high school - including that freshman history course, which was appropriately (or perhaps in this case inappropriately) entitled "Oklahoma History." It was not necessarily that the languages themselves were hidden from us. It would be difficult not to register on some level that our own city, Tulsa, was not named after an Englishman. Their status was what was never spoken about. Not once in my nearly two decades growing up in Tulsa did I ever hear the term "language endangerment," let alone "language revitalization." Was the board of education and our city and state in general embarrassed, as I suspected in several other cases, of our history? Did they wish to cover up the less savory facets of our past and pretend that they do not exist? Or did they judge these things unworthy of general knowledge, a commodity which we could not afford in the face of standardized testing? Perhaps it is a combination of all these things. What is certain is that any given student in my 1,018-person graduating high school class would not have known, and probably still would not know, that they lived and are living in an area of the nation with not only a spectacularly rich linguistic history, but a linguistic progeny which is threatened. It is not certain that these people would care about these languages any more after learning about their status than they did before learning about their status. However, I think that most of them would rather be given the choice to react to this information, instead of being given no choice thanks to a general ignorance of the subject. Mary S. Linn is Curator of Cultural and Linguistic Revitalization at the Smithsonian Center for Folklife and Cultural Heritage. Kyle Shaw lives in Norman, Oklahoma, and is pursuing higher education in speech and language disorders. In the final days of February, more than 460 people came from around the world to Honolulu, Hawai’i, to attend the 4th International Conference on Language Documentation & Conservation (ICLDC), which was held at the Ala Moana Hotel and organized by the University of Hawai’i Department of Linguistics and the National Foreign Language Resource Center. The ICLDC is a biennial gathering of linguists, language activists, speakers and learners that has become one of the premiere events of its kind. This year’s conference showcased a whopping 165 talks, 39 posters, 14 electronic posters, 2 plenary addresses and 12 Master Classes--the most expansive program we’ve offered to date. In this CELP blog post, we want to share some of the highlights of the conference for those of you who couldn’t attend. For each ICLDC, the organizers select a theme around which we ask our presenters to base their talks. This year’s theme was “Enriching Theory, Practice, and Application,” which highlights the need to strengthen the links between language documentation (that is, practice), deep understanding of grammatical structure (that is, theory), and methods for teaching endangered languages (that is, application). We had two sets of events that showcased our theme: a series of Special Sessions on Pedagogy in Language Conservation, and a series of Master Class on topics in linguistics. The Special Sessions on Pedagogy in Language Conservation were selected by a special panel of reviewers after a separate call for proposals in early 2014. In the end the reviewers selected four sessions of four talks each. The first session, called “From Technical to Teachable: Strengthening the Interface Between Documentation, Revitalization, and Teaching”, was organized by Dylan Herrick (University of Oklahoma), and Tracy Hirata-Edds (University of Kansas). This session also featured talks by Christopher Cox (Yukon Education) and Olivia Sammons (University of Alberta). The second session was called “The Teachable and the Learnable: The Role of Linguistics in Endangered Language Pedagogy" and was organized by Jordan Lachler (University of Alberta). Also presenting were Sally Rice (University of Alberta), Dorothy Thunder (University of Alberta) and Eugene Alexis (Alexis Nakota Sioux Nation). The third session, “Learner-Centered Pedagogy: Adapting to Dialect Variation, Multilingualism, and Social Dynamics in Endangered Language Education" was organized by Haley DeKorne (University of Pennsylvania), and featured talks by Janet Chávez Santiago (Research Library Juan de Cordova), Mario López Gopar (Universidad Autonoma Benito Juarez de Oaxaca), and Kiara Ríos Ríos (Universidad Autonoma Benito Juarez de Oaxaca). The final session was called “Language Pedagogy and Practice in Indigenous Australia: Learning Observations from Infancy to Teenhood.” It was organized by Barbara Kelley (University of Melbourne) and included talks by Rachel Nordlinger (University of Melbourne); Gemma Morales, Gillian Wigglesworth (University of Melbourne) and Lauren Gawne (Nanyang Technical University); Carmel O'Shannessy (University of Michigan); and Inge Kral (Australian National U). Another prominent feature of our program was the Master Class series, which focussed on the relationship between linguistic theory and language documentation, with each Master Class providing insight into a particular linguistic topic. The Master Classes were offered at three levels of experience: non-specialist classes for students with little to no background in linguistics, intermediate classes for those with some training in linguistics, and advanced classes for those with a great deal of experience in linguistics. The Master Classes were each two hours long and were held each afternoon of the conference in four concurrent blocks of time. The classes that were offered were “What is linguistics and how can it contribute to language documentation and conservation” (Patricia Shaw, University of British Columbia); “Introduction to first language acquisition for language documentation and conservation” (Kamil Deen and William O’Grady, University of Hawai’i); “Introduction to second language acquisition for language documentation and conservation” (Theres Grueter, University of Hawaii); “Elicitation and documentation of verb alignment and argument structure” (Andrew Koontz-Garboden, University of Manchester); “Elicitation and documentation of tense and aspect” (Juergen Bohnemeyer, University at Buffalo); “Elicitation and documentation of deixis,” (Sarah Cutfield, Australian National University); “Elicitation and documentation of intonation” (Sun-Ah Jun, UCLA); “Elicitation and documentation of tone” (Bert Remijsen, University of Edinborough); “Elicitation and documentation of valency-changing processes and constructions” (Marianne Mithun, UC Santa Barbara); “Elicitation and documentation of definiteness and quantification” (Peter Jenks, UC Berkeley); “Elicitation and documentation of evidentiality” (Lev Michael UC Berkeley); and “Elicitation and documentation of topic and focus” (Judith Aissen, UC Santa Cruz). In keeping with its mission to support linguistic diversity, the 4th ICLDC welcomed a highly diverse group of attendees and speakers from many walks of life. Over 460 people traveled to Honolulu, with participants coming from 31 countries on every populated continent. More than 107 universities and 26 Indigenous tribal bodies were represented, in addition to educators, policymakers, nonprofit and NGO staff members, endangered language speakers and learners, and laypeople who share a passion for language. Tracey Herbert and Shaylene Boechler of the First Peoples’ Cultural Council, a Canadian organization working to support the revitalization of the Aboriginal languages, arts, and cultures of British Columbia, presented a comprehensive 2014 report on the state of B.C. First Nations languages. Through an enormous effort including census data, surveys, interviews, and community outreach, FPCC gathers and disseminates data on language vitality, current revitalization and maintenance initiatives, and challenges facing First Nations languages in B.C. “ICLDC was a great platform to learn more about successful language revitalization strategies, and I was inspired by others’ work,” said Herbert. Igor Xoyon, principal of the Nimaläj Kaqchikel Amaq’, a Kaqchikel immersion school in Guatemala, presented with co-author Raina Heaton on the challenges and successes of language revitalization through immersion schooling. Through a combined approach of a rigorous Kaqchikel-medium curriculum, cultural and arts education, and linguistically-informed assessments of students’ acquisition of Kaqchikel, Nimalaj Kaqchikel Amaq’ strengthens Kaqchikel language, Mayan identity, and academic success among its students. Not content to travel from Guatemala to simply present a talk, Xoyon also served as a volunteer staffer at the ICLDC registration desk. Emmanuel Ngue Um, archive manager for the Archive of Languages and Oral Resources of Africa (ALORA) in Yaoundé, Cameroon, attended ICLDC to make new connections and share ideas for language documentation and archival. “This was an amazingly interesting conference. I’ve met a lot of people and made a lot of contacts, and this has also opened my mind and inspired new directions in language documentation,” said Dr. Ngue Um. Sally Akevai Te Namu Nicholas, of the University of Auckland, presented her experiences teaching Cook Islands Māori to undergraduates, using materials that engage students’ interest and encourage them to produce original narratives. Spoiler alert: having students tell stories about about how kua mate a Tampiritoa i a Sineipi (“Dumbledore died because of Snape”) is a far more compelling way to teach Māori than through rote exercises on conditionals and causatives. “If you can figure out what they want to talk about, they’ll talk,” noted Dr. Nicholas. Kenneth Frank, Crystal Frank, Caroline Tritts-Frank, and Craig Mishler traveled from Alaska to present a special panel on Gwich’in knowledge of caribou anatomy. Gwich’in has a rich and detailed lexicon for caribou bones, organs, and muscles; several talks explored this terminology in detail, and outlined traditional methods for hunting and preparing caribou meat. Gwich’in metaphor and simile also draw heavily upon this terminology; a talk on the link between caribou subsistence hunting and ethnopoetics dovetailed beautifully with Anthony Woodbury’s closing plenary on the documentation of verbal artistry. Thanks to the support of the National Science Foundation Documenting Endangered Languages Program, we are proud to have been able to offer scholarships to a handful of outstanding ICLDC attendees. These scholarships were worth up to US $1,500 and were designed to help defray travel costs so that presenters could make the trip to Hawai'i and share their work. We describe an app and mobile-accessible website designed for many kinds of learners of a dormant language. We provide details about an open-source version for potential beta-testers to try on their own language projects. Technical issues include the overall layout, format of the MySQL database, and linkages between elements. This paper discusses three assessments which evaluate the progress of students in a Kaqchikel immersion program in Guatemala. Picture-naming production and comprehension tasks were used to test for proficiency in phonology, morphology, and lexical acquisition. Results serve to improve the program and inform future methodological and curricular decisions. My presentation describes research on community archive initiatives in Alaska, Washington, and California that investigates the relationship between language ideology and the efficacy of documentation, preservation, and dissemination practices. I provide strategies to increase success of preservation efforts and advocate for more direct application of archival resources for educational dissemination. There are approximately 175 languages and dialects in the Philippines today, many of which are endangered. This paper will present an educational reform proposal that will specifically address the inclusion of endangered languages in the government’s K+12 educational program via the involvement of the local communities. While endangered-language speech communities can display extensive inter-speaker variation, language documentation projects rarely involve serious research on variation. This talk addresses obstacles to and strategies for documenting variation in endangered languages, taking the author’s recent documentary sociolinguistic work on Máíhɨ̃ki, a severely endangered language of northwestern Amazonia, as a case study. With less than a handful of fluent speakers left in a remote Haida community, a fluent Elder and young apprentice adapt strategies of language revitalization to best suit their community, primarily by using visual cues to create narratives in their indigenous language, for it to survive and to soon thrive. The organizers of the ICLDC would like to thank the National Science Foundation and the Linguistic Society of America for their support. Does speaking your Indigenous language make you healthier? What if we rephrase that question and consider wellbeing more generally. Australian linguist Michael Walsh suggests that we should consider not only physical and mental health but also economic, educational, political and social wellbeing. Phrased in those broader terms many people will agree that Indigenous language contributes to a greater sense of wellbeing. But lately evidence has emerged that Indigenous language is also associated with better physical health in the more traditional medical sense. A study published last October by a team at University of Alberta (Oster et al. 2014) has lately been receiving a lot of media attention (Toronto Sun, Edmonton Journal). These researchers link diabetes rates inversely to Indigenous language retention. Specifically, for the 31 Canadian First Nations communities in Alberta the authors found lower rates of adult-onset (Type II) diabetes in those communities with higher rates of indigenous language use. More language = less diabetes. This is summarized in the graph below. "First Nations differences in diabetes prevalence are due in part to differences in cultural continuity.... [T]he key to improving Indigenous health and lessening the burden of type 2 diabetes is the contemporary revitalization and continuation of the culture." To find causes we need to look more closely at diabetes itself. We know that diabetes rates correlate with obesity rates (again, correlation is not causation), and we know also that obesity rates correlate with increased carbohydrate (i.e., sugar) consumption. Now, what correlates with what? Well, it's a long story but the short answer is that increased carbohydrate consumption correlates with decreased fat consumption. Over the past 50 years the low-fat diet has become the "healthy" choice in North America. People have been told to decrease their consumption of fats--especially saturated fats--in order to reduce the risk of all kinds of bad things like heart disease. Of course, a body needs to eat, so we supplemented these lost fat calories with an increase in carbohydrates such as soft drinks and baked goods. This shouldn't be too surprising, and in fact as far back as the 1950's doctors were predicting that the low-fat diet would lead to an obesity epidemic. What does all this have to do with cultural continuity? Well we can only speculate, but a lot of the participants in the Oster et al. 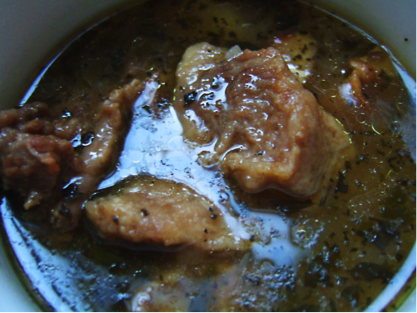 study noted the importance of traditional foods to the notion of cultural continuity. And what are traditional foods? I don't know much about Alberta, but here in Interior Alaska I think of things like moose head soup, a food high -- you guessed it -- fat. Traditional Alaska Native foods are generally lower in carbohydrate and higher in fat than store-bought equivalents. You can see a list of Alaska Native foods and their macro-nutrient contents here. The notion that traditional lifestyles are associated with better health is not new. An experiment conducted over 30 years ago in Western Australia found that even a temporary reversion to a traditional lifestyle lowered diabetes risk factors (O’Dea 1984). In that field study 14 Aboriginal men and women from the Mowanjum Community agreed to be monitored over a seven week period while they switched from an urban diet to a completely subsistence diet, living off the land hunting and gathering traditional foods. Before heading out to the land the main components of the urban diet included flour, sugar, rice, carbonated drinks—with approximately 50% of calories from carbohydrates. In contrast, the traditional diet included kangaroo, fish, yams, honey, figs, birds, crocodile, turtle, and crayfish—with 5-33% of calories from carbohydrates. Participants had no access to non-traditional, store-bought food. As a result all showed improvements in insulin secretion and insulin action, two of the major metabolic defects in type II diabetes. So living a traditional lifestyle and eating traditional foods can lower diabetes risk factors, even short-term. But what about the role of language? O’Dea makes no mention of Aboriginal language in the study. The Worroorran languages are moribund today but would presumably have been more vibrant 30 years ago when the study was conducted. The participants were an average of 54 years old, and they were out on the land with a single non-Aboriginal researcher. One imagines at least some Aboriginal language being used during this time. But even if O’Dea had measured language use, the point remains that just as in the Oster et al. study, language remains a proxy for traditional lifestyle. While Oster et al. (2014) is the latest study on language and wellbeing to receive a lot of media attention, the research in this area has been growing steadily over the past few years. Some of this literature is reviewed in McIvor et al. (2009). I'll mention just a few studies here. Rowley et al. (2008) found lower rates of mortality and cardiovascular disease among Aboriginal populations living a decentralized lifestyle away from urban centers. While the study did not consider the effects of language and culture, the authors conclude that "Conventional measures of employment, income, housing and education did not account for this health differential." The implication is that culture must play a role in accounting for the lower health risks among the decentralized populations, specifically "connectedness to culture, family and land." Again, language is mentioned here specifically. Another recent study by Hallet et al. (2007) found that Indigenous language knowledge varies inversely with suicide rates across British Columbia communities. None of the other six cultural continuity factors considered in the study was a better predictor of suicide rates. In fact, youth suicide rates effectively dropped to zero in those few communities in which at least a third of band members reported a conversational knowledge of Indigenous language. "Even after controlling for a range of socio-economic variables, living on one’s homelands/ traditional country and undertaking harvesting activities is associated with a higher level of self-reported happiness for Indigenous Australians. So too were learning an Indigenous language and participating in Indigenous cultural activities." Again, this correlation is not necessarily a causative relationship. It may simply be that happy people like to use their Indigenous language and live out on the land. But even an association between language and wellbeing is significant if it might eventually increase our understanding of what makes people healthy. Even if we can't yet show that language use causes greater wellbeing, the fact that a correlation exists should be enough for us to take the issue seriously. Indigenous language is not a magic bullet. In particular, Indigenous language will not cure diabetes. In the end we have to acknowledge that diabetes is not a cultural disease but a metabolic disease. Unless we acknowledge the role of diet in diabetes then no amount of cultural continuity will cure the disease. Increased consumption of traditional fatty foods may help, but only if also accompanied by decreased consumption of non-traditional foods like soft drinks and baked goods. That is, we need to recognize the nutritional value of indigenous foods, not just their cultural value. The relationship between language and wellbeing is likely complex and thus deserving of more study. Linguists have been notably absent in the studies I've mentioned here. Instead we've left the problem in the hands of public health researchers who may not grasp the subtleties of the linguistic issues -- such as the inherent problems with measuring language vitality. Collaborations between linguists and public health researchers are desperately needed. The 2014 Institute on Collaborative Language Research (CoLang) featured a course on Language and Wellbeing offered by a linguist (Alice Taff) and a health educator (Michael Young). And Colang 2016 will feature another course on this topic. Such cross-disciplinary collaborations will help us to better understand the role that language plays in peoples’ overall sense of wellbeing. If Indigenous language can make even a small contribution to overall wellbeing, then Indigenous language revitalization and maintenance is worthy of pursuing. The potential contribution of language and culture to health maintenance has already been recognized by the Public Health Agency of Canada. What they and others realize is that Indigenous language doesn't need to be a magic bullet or magic cure-all in order to have positive health effects, nor should we expect it to be. Given the skyrocketing costs of health care and the high rates of chronic disease among many Indigenous populations, even a small effect is valuable. 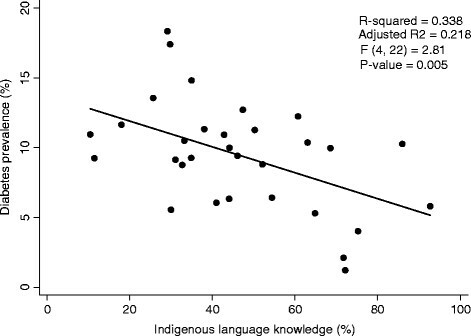 Of course most of us already see an intrinsic value in Indigenous languages, regardless of any potential health effects. But not everyone shares this view. So next time someone questions the value of Indigenous language maintenance efforts remind them that Indigenous language is a health issue. Biddle, Nicholas and Hannah Swee. 2012. The relationship between wellbeing and Indigenous land, language and culture in Australia. Australian Geographer 43(3): 215-32. Hallett, D., M.J. Chandler and C. Lalonde. 2007. Aboriginal Language Knowledge and Youth Suicide. Cognitive Development 22(3):392–9. McIvor, O., A. Napoleon and K.M. Dickie. 2009. Language and culture as protective factors for at-risk communities. International Journal of Indigenous Health 5(1):6-25. O’Dea, Kerin, 1984. Marked improvement in carbohydrate and lipid metabolism in diabetic Australian Aborigines after temporary reversion to traditional lifestyle. Diabetes 33:596-603. Wolsko, C., C. Lardon, S. Hopkins and E. Ruppert. 2006. Conceptions of wellness among the Yup’ik of the Yukon- Kuskokwim Delta: The vitality of social and natural connection. Ethnicity & Health 11:345-63. Anyone interested in the preservation of endangered languages has no doubt heard at least something about the importance of digital archives in maintaining collections of language data for longevity and access. But did you know there is an international network of digital endangered language archives whose mission it is to discuss key issues in language archiving, and to promote understanding of the role of digital archives among linguists and endangered language activists? (Okay, you probably did.) This network is called DELAMAN, the Digital Endangered Languages and Music Archives Network, and in this month’s CELP blog post I describe DELAMAN, its members, and its function. For more information, though, feel free to peruse the DELAMAN website. What is DELAMAN, and what do its member organizations do? DELAMAN is a consortium of international endangered language and music archives that was formed in 2003 to provide a forum for archive directors to discuss issues and ideas relevant to archiving. At the time of its formation, the digital archiving of endangered language and music materials was a relatively new undertaking, and most of the original members of the DELAMAN board were not, in fact, trained archivists. Rather, they were field linguists and ethnomusicologists who were tasked with developing and running digital language or music archives. As language archiving moved away from a paper-and-tape-based endeavor undertaken mostly by university libraries, and toward a digital model that could ostensibly be developed and administered by many kinds of organizations, DELAMAN became a forum for presenting problems and sharing solutions to a gamut of practical matters in archiving. Among these were questions of how to develop standards for collecting catalog metadata, how to best provide access to digital materials, and how to make endangered language archiving relevant for mainstream linguistics. In other words, DELAMAN archives are digital collections of endangered language and music materials, like audio/video recordings, transcripts and databases. Archives that are part of the DELAMAN network are those that can demonstrate a commitment to long-term data preservation, as well as participation in one or more internationally-agreed-upon standards about how to collect, maintain, and publish catalog information about the items they hold (like OLAC or OAI). Archives desiring to join DELAMAN usually submit documentation of their policies for collection, preservation and access to the DELAMAN board. These policies are then reviewed by the board, and successful archives can join as either full or associate members (the differences between these are described below). DELAMAN aims to hold meetings of the membership (usually one representative from each archive) at least once a year and in different locations around the world. In the past, we have held meetings in London, Sydney, Nijmegen, Austin, Mexico City, Cologne, Gniezno, Budapest and Honolulu. During these meetings, archive directors can come together to discuss best practices for making language archives useful and accessible. For instance, the 2013 meeting, held in conjunction with the 2nd annual meeting of InNET, considered the role of language archives in the Big Data movement; in 2014 DELAMAN developed a pricing model for language archiving to guide funding agencies like the National Science Foundation; in the future we plan to work in collaboration with other stakeholders to develop standards for citing archived data sets in linguistics publications. Who are the members of DELAMAN? DELAMAN currently has thirteen member archives at two levels of membership. Full membership is available to organizations that are actively involved in the long-term curation and management of digital endangered language materials. We currently have eleven full members of DELAMAN--all of these are established archives with fully developed policies for collection, preservation and access, and a demonstrated commitment to following international standards for metadata collection and sharing. DELAMAN also has a governing board that is elected by its membership. What can DELAMAN do for me? It may sound like DELAMAN is only for people who are directly involved with the running of an archive, but actually the organization aims to provide useful information for anyone interested in digital endangered language and music materials. We have a page of resources where you can find links to information on language documentation funding sources, how to digitize and preserve recordings, various useful software for working with digital recordings, metadata standards, and many other topics. If you are a documentary linguist who is looking for an archive in which to deposit your own materials, DELAMAN can help you identify an appropriate organization and tell you who to get in contact with. And finally, if you know of a collection of older recordings of language and music that are in need of digitization and preservation -- for example, old audio cassettes, reel-to-reel tapes, DAT tapes, and the like -- you can let us know via our Project Lost & Found page, and we can facilitate the proper long-term care of these precious recordings. This is a group-authored report on an assignment completed by undergraduate and M.A. students enrolled in ENG 418 "Language Endangerment and Death" at Southern Illinois University Edwardsville, in fall semester 2014. As a brief preview, the students were asked, in small groups, to critically investigate different online resources focused in some way on promoting information, data and/or tools on language documentation, endangerment, promotion and/or revitalization. They were asked to undertake this investigation in order to summarize and comment on the following: the purpose of the site, the human-resources infrastructure and internal organization, the types of materials available (content), ease of navigation, particular strong points, and also gaps or issues that the site faces in terms of access or usefulness. This assignment also connected to a semester-long case study of a specific, self-chosen, language. First, some background. Activities and opportunities in language documentation, preservation, promotion and revitalization have steadily increased and diversified in recent years, as evidenced by the sheer number of funding opportunities and also by the virtual explosion of resulting archives and catalogues (ranging from closed-access, small and local to large-scale/international and open-access) that can host and track language data for future access (Austin 2014). As Austin also notes, these activities reflect principles proposed by Himmelmann (2006) and by Bird and Simon (2003), and allow for the creation of permanent records (resources) of the linguistic practices and practices of vulnerable speech communities. Whether intentional or not, by virtue of their semi- or fully public online availability, these activities and outputs are also available to expanded audiences beyond just circles of language scholars and activists. This includes students of languages and linguistics at undergraduate or early post-graduate levels, including those who have no or little prior experience with documentation and language endangerment as sub-disciplines of linguistics (covered in an earlier, August 2014, blog on this page). Therefore, this blog looks at the larger topic of these resources from a slightly different perspective: we examine those online portals that aim to provide a public and interactive interface to newcomers to this field. Nine of the co-authors of this blog represent this type of user. We now turn to the findings of these students for the selected sites. We should note that this blog entry is not simply trying to identify problems and dwell on these, but rather to comment on how these tools are actually being used (or able to be used) in the here-and-now, by audiences of different types. Undergraduate students exist in a world where the abundance of websites they encounter are geared at selling something (consumer-oriented) or at sharing personal information and opinions (social engagement-oriented). This activity emphasizes the information and content-rich orientation that the Internet also provides and is therefore a lesson in a particular type of digital literacy, where students are invited to investigate, make meaning of, and critique a specific set of digital resources as they may (or may not) connect to the larger goals of the course. We should also note that this assignment was completed in fall 2014, and some things may have changed about these resources in the interim time. A. Look for an “about us/about this page/history/background” link and discuss the purpose/goal and point of the web resources. Who is/are behind their creation? What audiences are these web resources aimed at? If this is not explicitly stated, then what can you deduce from your own investigation? Note: This information might be at the top of the home page, or at the very bottom. Also, you might want to consider “joining” or “registering” with one of these pages, as long as you are not required to pay any money! B. Explore the resources—follow the major links and/or tabs. What sections or pages are tied to the web resources? What types of content can you discover? (e.g. video, sound files, statistical data, references and/or bibliography, testimonials)? Give examples. C. What types of language(s) are the focus of these resources? Are the resources dedicated to certain regions or language groups, or are they dedicated to global concerns? Is the target only endangered languages (exclusively)? If so, what counts as an “endangered language” in this context? Give examples. D. How are these resources supported and/or sustained? Who funds this work? Is it volunteer? Is there a listing of individuals involved or any indication of group structure? Do these resources offer funding to researchers or to community groups? Do these resources identify and/or celebrate individuals or groups that have done work to promote language survival and maintenance? Give examples. E. Do these resources make use of online social media like Twitter, Facebook, blogs or other? How effective do you think it is? Can you find any recent posts or correspondences on social media to demonstrate that these resources really take the function of online social media seriously and are used actively, currently? F. What’s one really interesting (or perplexing or troubling) aspect of these resources that you discovered? Please share this with the rest of the class during your presentation. The motivations behind these questions are as follows. Question A. addresses authorship and ownership. Question B. asks for a deeper exploration into the resource's internal architecture and organization. Question C. aims to get students to begin thinking about the resources in terms of their own larger research project. It also asks them to begin critiquing some of the basic definitions they have been encountering in class. Question D. asks students to investigate the organizational support behind the resource (who funds/builds this? Educators? A network of scholars? Community members? Missionary groups? Private industry? A combination?). Question E. invites students to assess how well these resources keep up with changes in digital structure and orientation, particularly with respect to enterprise social networks. And finally, Question F. invites students to come up with novel comments, compliments or criticisms that the instructor might not have thought about as a different type of user when she first created the assignment. We now summarize the responses to each question, by order of resource/site. First, Question A (purpose of the site): Students understood the purpose of HRELP to facilitate documentation of endangered languages, train people to do this, and to preserve and disseminate documentation materials in order to support the promotion of endangered languages overall. They understood ELAR as a unit contained within the larger HRELP network, a digital repository of language data. They found these goals to be explicitly stated in obvious and easy-to-find locations on the home or “about us” pages. Students understood Living Tongues (LT) as informing the public and gaining financial support to facilitate language documentation and research. They understood Enduring Voices (EV) to have more of an education focus, an observation further bolstered by the National Geographic affiliation. Students understood ELCat as a database of information about endangered languages and also as a place where online audio-video or text could be linked and displayed. They understood PARADISEC (Pacific and Regional Archive for Digital Sources in Endangered Cultures) to be a place of information archiving (with a primary focus on languages of Australia), although one area of interest is older data that are in imminent danger of being lost. Students understood the purpose of DoBeS as a place where documentation funding could be obtained, and also a place where collected data can be archived. They also saw an additional goal of DoBeS as a place for general education and awareness about language endangerment. They understood CELP as a collective of (primarily) linguists working together to share information on language documentation, endangerment, maintenance and revitalization. Next, Question B (resources): The most obvious resources available from HRELP include links to publications (which they found very useful in their research projects), announcements of events (which were primarily too far away, in their opinions), and other documentation resources, including software, and an entire academic program devoted to language documentation. They also observed that ELAR links to a catalogue of material on over 140 languages. Students saw LT as primarily a link to its companion project (EV) with the most noticeable link being to National Geographic, and also reports on documentation trips, selected video clips, and talking dictionaries, which they found innovative and interesting. Students understood PARADISEC to have links to language collection catalogues, an interactive map and some (limited) search functions. Students saw ELCat as a place for language exploration, particularly at early phases of research, and they appreciated the interactive map. Students observed that DoBeS has a number of tabs that are clear, an interactive map, sample videos that are interesting and attention-getting archive links, and they also quickly noticed the Volkswagen Foundation site. The students observed that these links lead mainly back to the Linguistic Society of America (LSA), along with some links to organizations that CELP partners with, a link to a 2006 field guide, links to field reports, and other important groups. Question D (financial support): Students noted that with HRELP, projects are funded through a research grant provided by Arcadia, a charitable fund established to support the preservation of cultural heritage and the environment. Students and faculty from the University of London carry out the projects. The website lists the names of all faculty, students and alumni who have been involved. They observed that ELAR is similar but also a bit different. ELAR is funded by Arcadia as well and the team consists of core staff with overlapping expertise in archiving, digital media, preservation and linguistics. ELAR employs and recruits voluntary archive assistants, drawn from currently enrolled Linguistics post-graduate students at SOAS who have skills in data management, office tools, and a keen eye for detail. Students observed that LT and EV receive a bulk of their funding through donations and with the help of National Geographic. Students learned that PARADISEC is governed by the University of Sydney, the Australian National University, the University of Melbourne, Australian Research Council, and the United Nations Educational, Scientific, and Cultural Organizations. It receives funding from Gravened, APSR, UNE, and from National Computational Infrastructure, as well as donations from the University of New England. ELCat was created by the Institute for Language Information and Technology at Eastern Michigan University and the Catalog of Endangered Languages at the University of Hawai'i at Manoa. Funded by National Science Foundation, giving rise to the Alliance for Linguistic Diversity. The page is updated and maintained by the Endangered Languages Governance Council. The project is a collaborative effort between many different groups who have dubbed themselves The Alliance for Linguistic Diversity, including The Association for Cultural Equity, Grassroots Indigenous Multimedia, The Rosetta Project, and The World Oral Literature Project. The website is further guided by the Endangered Languages Governance Council, which is a group of specific people from particular groups meant to guide the website while bringing an element of diversity to the site. The webpage has been funded by the National Science Foundation since 2011. As for DoBeS, The Volkswagen Foundation created and funded the program and the archive is part of The Language Archive (TLA), located at the Max Planck Institute for Psycholinguists in Nijmegen. Students noted that in contrast to the other sites, they found that CELP is a group within LSA, but there is little information about the group or how it is sustained. The main page does list members, but there is little information about the group's history or other information. Question E (social media): Students noted that HRELP makes use of social media through Facebook, but their profile is not accessible on their website, which makes its somewhat obscure. The page has only around 170 followers, but managers do post to their page weekly. Finding their Facebook page requires searching by the project’s full name, 'Hans Rausing Endangered Languages Project.' Searching by their acronym 'HRELP' takes users to a completely unrelated page about a movie. Students noted that in contrast, ELAR has Facebook, Twitter, and Email accounts. These three links are easily accessible on their home page because in the upper right hand corner they have the three website icons. However, their last Facebook post was on April 2014, and their last tweet was June 8 2014. Students commented that it doesn’t seem that they post often enough to really have their social media output make an impact. Students noticed that the LT website regularly makes use of both Facebook and Twitter, featuring articles and images about endangered languages and related topics. Through their social media LT spreads information and awareness not only about their language project, but other language projects in the field. The LT Twitter page has over four thousand followers and seems to be doing a good job of using social media as a platform for awareness. The students observed that PARADISEC does not have any social media accounts. They learned however that PARADISEC does however work with Ethnologue and the Linguist List. As for ELCat, they have a RSS Feed, Facebook, and Twitter accounts. The website makes use of the social media and I found recent posts from last week in both the Twitter and Facebook. Similarly to PARADISEC, DoBeS does not make use of any online social media or blogs. CELP uses Twitter and Facebook, which are updated regularly. There is a link directly to the Facebook page, but not to the Twitter page. The link to the blog takes one to an unrelated page, but the blog can be found within the Facebook page, though there is no mention of that anywhere except in the Facebook newsfeed. Finally, Question F (evaluation): Students found that one of the most useful aspects of the HREL and ELAR sites was its online library resource of over 400 links that leads users to sites concerned with language documentation and revitalization. However, students were unanimous in their feeling that there needs to be some updating done to remove outdated and broken links, and to add links for research projects that have been completed. The students in general were impressed with both LT and EV. LT They liked how LT has worked on many language endangerment projects, all selected for their geographic positions. However, they found that although the website briefly defines what a language hotspot is it would be nice to understand the language selection in more detail. Students found PARADISEC to be a bit of a paradox. The web page was difficult to navigate. They also observed that many of the links did not work. They found that it is perhaps not the best site for beginning linguists, but they were impressed by the linguistic diversity in Australia and with the number of languages researched in the area. Students generally enjoyed working with the ELCat site and thought it was user friendly. They found it to be useful for anyone in the field of linguistics, no matter how novice or advanced. They appreciated the interactive nature of the site, particularly the map and the access to audio-video files. Much like PARADISEC, students found DoBeS to be to navigate. Through time, however, they understand that as archives, PARADISEC and DoBeS are not the same type of online resource as the other sites area. Students found CELP difficult to work with. They found that certain pages were confusing. They found the blog link and other tips and guides to be outdated and the field guide, some times by up to eight years. We want to end our report of this assignment with some general observations. First, students found that many of these sites provided a professional, attractive design, and were a way to attract new users and to get students enthusiastic about embarking on research on endangered language or on documentation. The best sites were ones with active and functioning links to other references or resources. In this way, they function as a sort of reference index or database that one might see on an online library at their university. The students who investigated LT and EV found the Talking Dictionaries to be very interesting and a way to add a real and concrete dimension of an endangered language from a remote part of the world (at least compared to southern Illinois!). Students were sometimes frustrated by restricted access, particularly because this was not always obvious until one arrived at an ‘access denied’ link. They understood that privacy and permission settings meant that some materials were not publicly available, but they sometimes found that this was not clearly indicated until one hit a ‘dead end,’ so to speak. The further they learned about a project or a language, the more they wanted to explore, and they were occasionally stymied by closed access. Holton (2014) discusses the issue of mediating the corpus (in our case, the online resource), i.e. making it easy to dig into materials and learn more. In the same spirit, Woodbury advises that tools should "narrate a path" for new users (2014: 24). Resources should provide directional guidance to new users such that they can easily, enjoyably and maximally make use of the resource. Students found that this was evident in DoBeS, with ELCat and with Living Tongues, as they all contained prominent examples on their home page, ways to draw in new visitors. This is akin to Woodbury’s “special exhibits” recommendation (29). To the extent that the online resources chosen for this project were able to do this, they were positively evaluated by the students in ENG 418. One question not asked in this assignment that could be asked in the future is this: What can undergraduate students contribute back to the resources? In other words, are undergraduates only recipients, or can they give something? This question touches on Woodbury (2014)'s proposal for audiences, that the author/resource-audience relationship should be bidirectional. We see user reviews and critiques are one example of this bidirectionality. There is a risk that uninformed or untrained reviewers can get the wrong idea about a resource and form their critique based on that. Mediated critiquing in the form of this report is one way to deal with this. Austin, Peter. 2014. Language documentation in the 21st century. JournaLIPP 3:57-71. Bird, Steven and Gary Simons. 2003. Seven dimensions of portability for language documentation and description. Language 79(3):557-82. Holton, Gary. 2014. Mediating language documentation. In David Nathan & Peter K. Austin (eds.) Language Documentation and Description, vol 12: Special Issue on Language Documentation and Archiving. London: SOAS. pp. 37-52. Himmelmann, Nikolaus P. 2006. Language documentation: What is it and what is it good for? In Jost Gippert, Nikolaus P. Himmelmann and Ulrike Mosel (eds.) Essentials of Language Documentation (Trends in Linguistics. Studies and Monographs, 178), 1-30. Berlin: Mouton de Gruyter. Woodbury, Anthony C. 2014. Archives and audiences: Toward making endangered language documentations people can read, use, understand, and admire. In David Nathan & Peter K. Austin (eds.) Language Documentation and Description, vol 12: Special Issue on Language Documentation and Archiving. London: SOAS. pp. 19-36. ¬throughout the month of November (broadcast dates here: http://risingvoicesfilm.com/broadcast-dates/). Rising Voices is presented and distributed nationally by American Public Television (APT). --- The Language Conservancy is a nonprofit organization that works with Native American tribes to preserve their ancestral languages by providing educational materials, teacher trainings, dictionaries, and other materials that assist in language revitalization. The primary service area for the Language Conservancy is in the American Northwest, including Montana, North Dakota, and South Dakota. Rising Voices/Hotȟaŋiŋpi, a film by Lawrence Hott and Diane Garey, is a production of Florentine Films/Hott Productions, Inc. in association with The Language Conservancy. The project is funded by Vision Maker Media with major sponsorship provided by the National Endowment for the Humanities, the Corporation for Public Broadcasting, the Administration for Native Americans, the Dakota Indian Foundation, the South Dakota Humanities Council, and the North Dakota Humanities Council – a nonprofit, independent state partner of the National Endowment for the Humanities. Any views, findings, conclusions, or recommendations expressed in Rising Voices do not necessarily reflect those of the North Dakota Humanities Council or the National Endowment for the Humanities. Are you a graduate students looking for opportunities for hands-on training in linguistic fieldwork and language documentation? Our experimental program is aimed primarily at first-year Doctoral students and MA students who hope to get a Ph.D. in linguistics with a major fieldwork component. We are especially interested in students who would like to explore the possibility of fieldwork in Indonesia, an area of the world that is both very diverse linguistically and one in which many of the languages are endangered.